The UK conveyancing market bounced back in the mid-summer following a significant drop in activity in Q2 2017, with challenger firms taking full advantage of a revival in transaction numbers across the property market. The Q3 2017 edition of Search Acumen’s Conveyancing Market Tracker reveals that total transaction volumes over the three-month period reached 254,606. This was 21% higher than the four-year low recorded during Q2 2017 (210,964), although it remained down 6% year-on-year from 271,197 in Q3 2016. This mid-summer boost in conveyancing activity resulted in a slight rise in the number of active firms in the market, up 1.2% to 4,191 from 4,143 in Q2. 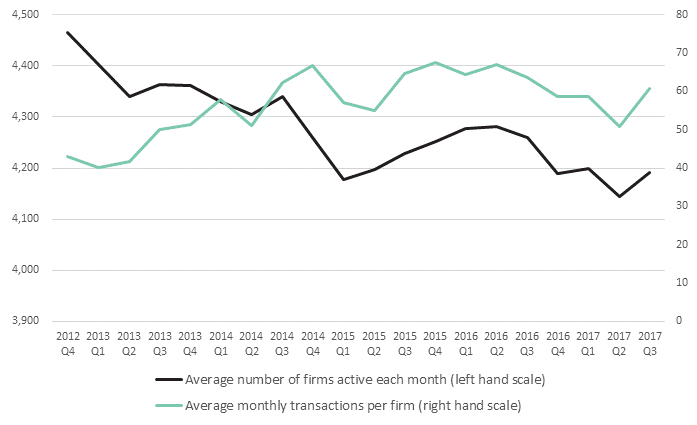 With more work to go round, the average firm processed 61 transactions in Q3, up by 19% from 51 in the previous quarter to the highest figure in the last year (since Q3 2016 – 64). 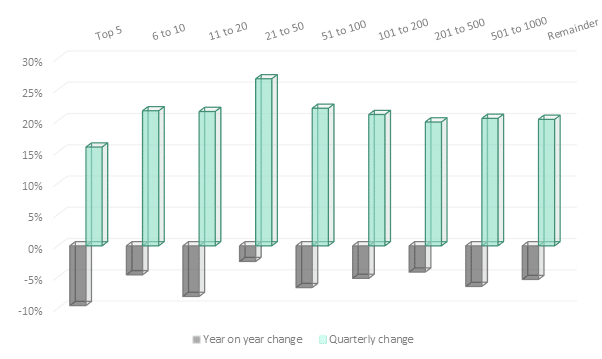 Search Acumen’s analysis of Land Registry transaction data also reveals a considerable uptick in challenger firms – those registering between 100 and 500 transactions each month – which grew 54% from 79 in Q2 2017 to 122. While total activity perked up in Q3 2017, the top five ranking UK conveyancing firms saw pressure growing from the challengers beneath them. Activity levels among the top five ranking firms each month increased 16% over Q3 2017 as a whole, but this was the smallest quarterly (QoQ) increase across the market. Transaction levels at the top of the market were also 10% lower than during Q3 2016 – the largest yearly (YoY) decline of any category. In contrast, firms ranked between 21st and 50th witnessed the largest increase in average transactions, rising from 501 across the quarter to 635 (27%). Comparing different types of transactions, Dealings transactions saw the largest increase in volumes, increasing by 25% QoQ, from 181,166 to 225,981. Dispositionary First Lease transactions experienced the largest decrease, dropping 17% QoQ from 727 to 602. Transfer of Part transactions also witnessed a quarterly drop, down 5% to 22,729 which also amounts to a 17% YoY decline. “After the noticeable dip in conveyancing activity in Q2, it’s encouraging to see an uptick in business through the late summer and autumn period. The conveyancing industry has broadly rebounded to ‘business as usual’, picking up where it left off at the beginning of the year. “This recovery is testament to the resilience of our industry and the productivity push conveyancers are giving to ensure the cases are processed efficiently. As activity has picked up, so has the number of firms in operation and the average firm has enjoyed its busiest period for a year. “It is interesting to see the strong growth of challenger firms. A healthy conveyancing sector relies on competition. We know from experience how tenacious and hard-working these firms are and we’re proud to continue to support them as they find innovative ways to grow their businesses. “Despite these positive strides, sadly ‘business as usual’ means conducting conveyancing business in the midst of the greatest housing crisis our country has known in modern times. All eyes are fixed on Phillip Hammond to deliver the antidote against the most challenging economic backdrop we have seen since the recession.